Every once in a while I crave a peanut butter and jelly sandwich made with Skippy peanut butter, Welsh’s grape jelly, and of course, fresh white bread. I am not sure if it is the actual taste that I crave or the chance to relive a moment in my childhood. Nevertheless when the urge comes, there is only one thing I can do: Go to the cupboard, get the Skippy, and make it all happen. Today was one of those days. I went to the cupboard and was startled to find an unopened jar of Jif peanut butter! Jif? But my craving is for Skippy just like I had in my lunchbox every day in elementary school. I looked further into the depths of the cupboard for surely there was a jar of Skippy hidden there. I found something far worse than finding a jar of Skippy in the very darkest corner of the cabinet. 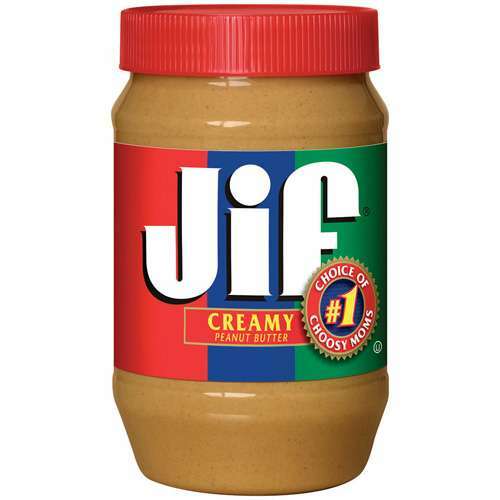 I found another jar of Jif!!! At that moment, I had a vague recollection of a 2-for-1 sale at Publix and thinking at the time I should at least try Jif. I suppose the idea behind the marketing effort was that every woman would want to be seen as a “choosy mother”, someone who wanted only “the best” for her child. I am not sure if they choose Jif, but my daughter and four daughters-in-law all choose what they think is the best for their children with respect to the food they eat, the schools they attend, their music teachers, and athletic coaches and programs. Throughout my life, I have been very choosy when it came to my career, carefully selecting a field I cared about and one in which I had the skill set to positively influence the lives of others. I have also been choosy about my residence, finding a place with a high level of energy and a diverse mix of residents. I am also choosy when it comes to maintaining a healthy mind and body, however, occasionally not choosy enough! One might argue that I have been far too choosy in selecting a life partner. I would love to chat more about that but right now I’ve got to go to Publix to buy a jar of Skippy, and drop off the two jars of Jif at a local food bank. Well, I must say… you “wear” choosy well. Although I strongly concur you are grounded, I have to admit I like my visual of the little girl eating her peanut butter & Welsh’s grape jam (my favorite) sandwich in elementary school. Your blog validates the choosy little girl in me. I used to eat mine toasted while reading the local newspaper before school. From a young age we know exactly what is expected of us for our mind, body and soul. Yes, I know it is important to have life coaches, but I believe that everyone is born with a moral compass. We just sometimes go off track with our plan in the hope of finding excellence in life. Sometimes I forget to appreciate and be thankful for “my life.” Forgetting sometimes that it is exactly how it is meant to be. Being choosy is a GOOD thing. Especially at this time of our lives. We have the experience to make the correct choice because we know the red flags,that we may not have seen when younger,and listen to those warnings. Amen! We have to think enough of ourselves to be choosy. Be well, thanks for reading! Amen, indeed! If we are not choosy about our own wants and needs, who will be? And try Trader Joes almond butter. No sugar! And while I acknowledge that it is an acquired taste, you will feel as if you are choosing to eat more healthy PB&j sandwiches. Enjoyed reading this one. I too am choosy – that is why you are among my shiort list of women I want to spend time with. As far as choosing a mate one can never be too choosy – we only have one life why waste it with someone who is not ideal for us? I am lucky am on you choosy kist, so I thank you!